1. Operate the climate control system in several modes. -Do the self-diagnostic function with the HDS (see page 21-102) or climate control unit (see page 21-103). 2. 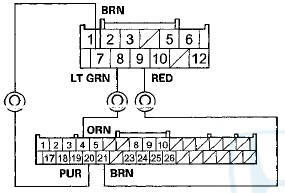 Do the Navi system links (see page 23-176). - вЂў If Air-con icon is red, go to step 3.
вЂў If TALK/BACK icon is red, go to "voice control does not work/respond" in the navigation system symptom troubleshooting (see page 23-226). 4. Disconnect navigation unit connector B (32P). 5. Disconnect climate control unit connector B (12P). 6. Check for continuity between the following terminals of climate control unit connector B (12P) and navigation unit connector B (32P). -Repair an open in the wire(s) between the climate control unit and the navigation u n i t.
7. Check for continuity between body ground and climate control unit connector B (12P) terminals No. 7, 8, and No. 9 individually. -Repair a short to body ground in the wire(s) between the climate control unit and the navigation unit. 8. Reconnect climate control unit connector B (12P). 9. Disconnect navigation unit connector B (32P). 10. Connect navigation unit connector B (32P) terminals No. 4, 20, and No. 21 with jumper wires. 11. Turn the ignition switch to ON (II). 12. Press and hold the AUTO button, then press and hold the OFF button. -Do the Unit check with the navigation system (see page 23-182). -Substitute a known-good climate control unit, and recheck. If the symptom goes away, replace the original climate control unit (see page 2 1 - 1 9 0 ).